In recent years, the distribution of works of art, including pictures, music, video and textual documents, has become easier. With the widespread and increasing use of the Internet, digital forms of these media (still images, audio, video, text) are easily accessible. This is clearly advantageous, in that it is easier to market and sell one's works of art. However, this same property threatens copyright protection. Digital documents are easy to copy and distribute, allowing for pirating. There are a number of methods for protecting ownership. One of these is known as digital watermarking. Digital watermarking is the process of inserting a digital signal or pattern (indicative of the owner of the content) into digital content. The signal, known as a watermark, can be used later to identify the owner of the work, to authenticate the content, and to trace illegal copies of the work. Watermarks of varying degrees of obtrusiveness are added to presentation media as a guarantee of authenticity, quality, ownership, and source. Digital watermarking is an extension of steganography, is a promising solution for content copyright protection in the global network. It imposes extra robustness on embedded information. 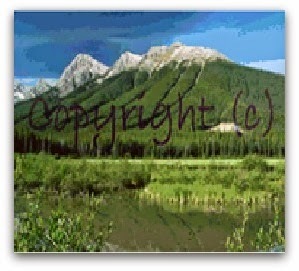 Digital watermarking is the science of embedding copyright information in the original files. The information embedded is called watermarks. a. Visible watermarks are designed to be easily perceived by a viewer (or listener). They clearly identify the owner of the digital data, but should not detract from the content of the data. b. Invisible watermarks are designed to be imperceptible under normal viewing (or listening) conditions; more of the current research focuses on this type of watermark than the visible type. a. A fragile watermark is embedded in digital data to for the purpose of detecting any changes that have been made to the content of the data. They achieve this because they are distorted, or "broken", easily. Fragile watermarks are applicable in image authentication systems. 1. They aim to mark digital data permanently and unalterably, so that the source as well as the intended recipient of the digital work is known. Copyright owners can incorporate identifying information into their work. 2. With a tracking service, owners are able to find illegal copies of their work on the Internet. 3. Watermarks can be used to identify any changes that have been made to the watermarked data. Digital watermarking is a technology for embedding various types of information in digital content. In general, information for protecting copyrights and proving the validity of data is embedded as a watermark. A digital watermark is a digital signal or pattern inserted into digital content. The digital content could be a still image, an audio clip, a video clip, a text document, or some form of digital data that the creator or owner would like to protect. The main purpose of the watermark is to identify who the owner of the digital data is, but it can also identify the intended recipient. Why do we need to embed such information in digital content using digital watermark technology? The Internet boom is one of the reasons. It has become easy to connect to the Internet from home computers and obtain or provide various information using the World Wide Web (WWW). All the information handled on the Internet is provided as digital content. Such digital content can be easily copied in a way that makes the new file indistinguishable from the original. Then the content can be reproduced in large quantities. Authentication identifies if content has been altered or falsified. For example digital watermarking can verify authenticity and identify counterfeiting as a second layer of security for encrypted content. The presence of digital watermark and/or continuity of watermark can help ensure that the content has not been altered. Digital watermarks have been used in the last few years to protect the ownership of digital data. Various techniques developed make use of the human audio-visual system. Legitimate business and webmasters have nothing to fear from copyright law or new form of on-line enforcement technology found in digital watermarks and tracking services.